An ideal in vivo model for the evaluation of anti-TIGIT drugs requires: 1) a level of TIGIT similar to that of its native expression, 2) a highly simulated tumor microenvironment, and 3) a powerful immune system to produce significant effects. Traditional immunodeficient mouse models are unable to meet these demands due to their damaged immune system. Shanghai Model Organisms has developed a humanized mouse model of TIGIT to provide a powerful tool for evaluating the efficacy of anti-TIGIT drugs. TIGIT belongs to the PVR family of immunoglobulin (Ig) proteins. 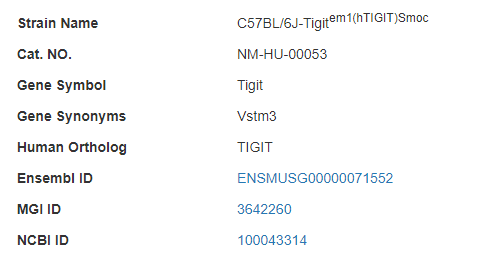 TIGIT is composed of an extracellular immunoglobulin variable-set (IgV) domain, an intracellular domain with a canonical immunoreceptor tyrosine-based inhibitory motif (ITIM) and a phosphorylated fragment of immunoglobulin tyrosine tail. The polio virus receptor (PVR or CD155) is considered as a ligand of TIGIT with high affinity, and the affinity of PVRL2 (Nectin2 or CD112) for TIGIT is relatively weak. The cancer-immunity cycle refers to the process in which an immune response is developed in an appropriate manner to kill cancer cells. In short, dendritic cells acquire antigen from dead cancer cells and then enter lymph nodes to activate T cells. The activated T cells then leave the lymph nodes, enter the circulatory system, infiltrate into the tumor microenvironment through the blood vessel wall, and recognize and kill tumor cells via specific receptors before entering the circulation again. 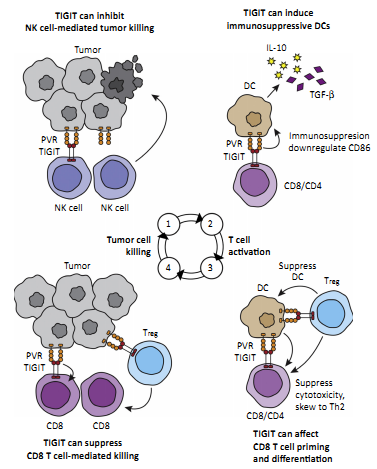 TIGIT can directly inhibit the effect of CD8+ T cells. Alternatively, TIGIT+ treg can inhibit CD8+ T cells and prevent the clearance of cancer cells. Scientists are actively developing monoclonal antibodies targeting the TIGIT immune checkpoint. 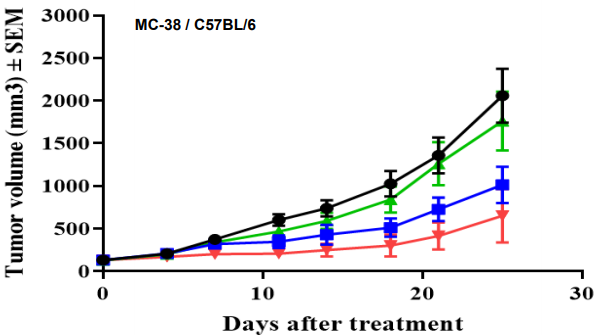 Antibodies that block the interaction between TIGIT and CD155 have been shown to block the inhibitory effect of TIGIT on the cytotoxicity of NK cells and further reduce tumor growth. An ideal in vivo model for the evaluation of anti-TIGIT drugs requires: 1) a level of TIGIT similar to that of its native expression, 2) a highly simulated tumor microenvironment, and 3) a powerful immune system to produce significant effects. Traditional immunodeficient mouse models are unable to meet these demands due to their damaged immune system. Shanghai Model Organisms has developed a humanized mouse model of TIGIT to provide a powerful tool for evaluating the efficacy of anti-TIGIT drugs. Figure 2. Generation strategy of humanized TIGIT mice. 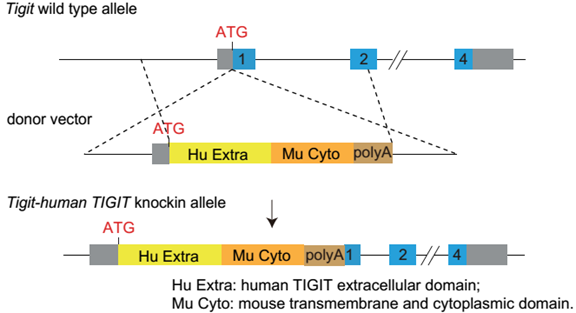 Under the C57BL/6J genetic background, the coding sequences for the extracellular domain of human TIGIT and the transmembrane and intracellular domains of murine TIGIT were inserted into the ATG position of the mouse TIGIT gene, so that the expression of endogenous TIGIT in the mouse was replaced by the expression of humanized chimeric protein. Figure 3. 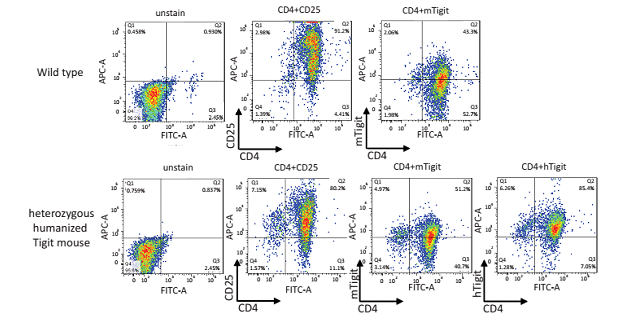 Expression of human TIGIT in the polarized CD4+ T cells of humanized TIGIT mice is detected by FACS. Spleen Naive CD4+ T cells were isolated from heterozygous humanized TIGIT mice. After in vitro stimulation, activation and expansion by cytokines and antibodies, the CD4+ T cells were re-stimulated with PMA/ionomycin before the expression of human TIGIT in polarized CD4+ T cells was detected by FACS. The results showed that the active expression of human TIGIT could be detected in polarized CD4+ T cells collected from humanized TIGIT mice, and the expression trend of human TIGIT was similar to that of murine TIGIT. Fig 4. In vivo validation of anti-tumor efficacy in a MC38 tumor-bearing model of humanized TIGIT mice. Homozygous humanized TIGIT mice were inoculated with MC38 colon cancer cells. After the tumors grew to 130 mm3, the animals were randomly assigned into a control group and a treatment group (n=7). The results showed a significant anti-tumor effect was observed when the antibody targeting human TIGIT was administered together with Anti-PD-L1 analogue. (Completed in collaboration with Harbour BioMed).